The 8 Best Burgers in Wyoming! From the staple bison burger, to gourmet, all-beef, grass-fed classics, you’ll find some of the juiciest and heartiest burgers in the Cowboy State. Serving up big burgers for big appetites, the best burger joints in Wyoming all strive to provide the best in quality. It doesn’t matter if it’s a quick bite restaurant or an upscale, sit-down spot, all of the burger joints featured here are serving up excellent fare. Here are our favorites. Liberty Burger proudly proclaims “Give me liberty or let me starve!” Family-owned and Texas grown, Liberty is all about revamping the concept of the classic burger and making it all their own. Not only are the burgers of excellent quality, but Liberty is environmentally responsible as well. Liberty’s beef originates from a single herd and is grass-fed in Dallas. The meat is processed without stimulants, hormones, and antibiotics. They also utilize grass-fed wild buffalo for their bison burgers, also without stimulants, hormones, and antibiotics. Owned by Cheyenne natives Jerry and Sandy Inniss, 2 Doors Down is located, well, just two doors down from their well-known restaurant, Pizzeria Venti. The atmosphere at 2 Doors Down is relaxed and family friendly. On top of that, they’re serving up specialty burgers like the “South of the Border” burger with chipotle mayo, pepper jack cheese, jalapenos, shredded lettuce, and tomato. 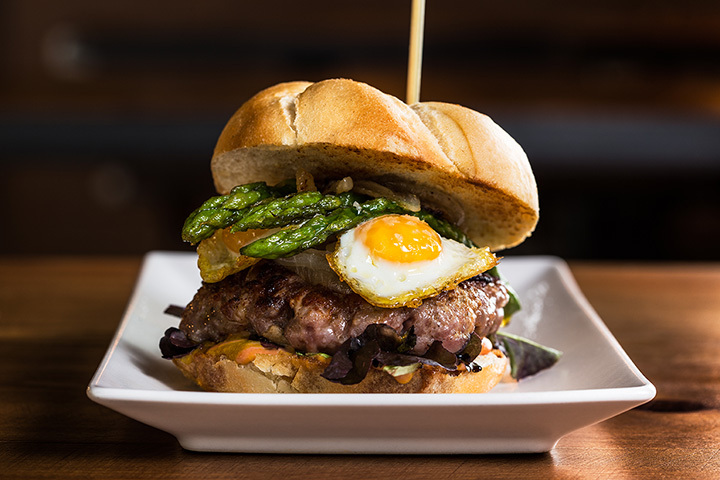 Be sure to try the “Barnyard Burger,” featuring American cheese, Applewood smoked bacon, fried egg, leaf lettuce, tomato, and mayo all on a pretzel bun. Wyoming oldest brewery also happens to be home to some of the best burgers in the state. Great beer and great beef. What a pairing! Some of Snake River’s “Pub Favorites” include the “Big Hole Burger,” made with mead ranch, dry-aged local beef and finished off with bacon, house-made pickles, special sauce, and a choice of white cheddar, Swiss or blue cheese. If you want to go with more of a Wyoming signature, try the “BBQ Bison Burger” made with Durham ranch, Wyoming bison and topped with smoked gouda, bacon, and chipotle barbecue sauce. Self-described as a “warm and friendly place to meet and enjoy good food with friends, family or business associates,” Roxie’s is devoted to providing the best. As is wildly popular in Wyoming, Roxie’s has a killer bison burger, comprised of natural grass-fed buffalo, cheddar cheese, crispy onion straws, and Huckleberry ketchup. Maybe you’d prefer to try the Wyoming Whiskey Burger, topped with mozzarella, Applewood smoked bacon, and bourbon barbecue sauce. You can’t go wrong here. Shifters in Casper is one of the best quick-bite burgers you’ll ever have. Try their special E.B.T. burger made with three, 100 percent ground beef patties, lettuce, pickle, tomato, ketchup, dressing, bacon, cheese and onion rings right on the burger. They take classic ingredients and do it incredibly well. Finish off your meal with something sweet—their root beer floats will have your taste buds dancing. These delicious, fresh burgers feature beef that’s ground to order and picked up every morning at Crowbar’s local butcher. Try signatures like the “Raven,” made with smoked gouda, caramelized onions, bacon, and creamy mustard. Or maybe it’s the vegetarian “Cardinal” that you prefer, made with tempura fried eggplant, avocado, tomato, red peppers and French onion sauce. This modern chophouse has received praise from a variety of sources, and there’s a good reason why. While they specialize in delicious steak, their burgers are absolutely to die for. Give the “Chef’s Burger” a try, made with chef’s blend ground beef, smoked cheddar, bacon, tomato jam, lettuce, and pickles. Hungry yet? There’s more. That’s just on their dinner menu! Their lunch menu features custom burgers to build yourself! Top locally-pastured, grass-fed beef with anything from white cheddar cheese to brie, caramelized onions to banana peppers, and avocado to fried egg. The options are endless! And delicious.